As well as being a mega polish-aholic I love my beauty products. 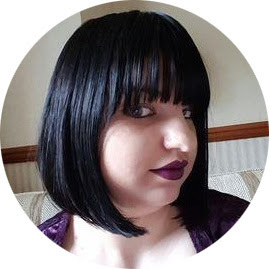 I thought I would give a quick run down of some of my beauty bargins and fails from this month (it's also so I can keep track of what I do/don't like). All opinions here are my own. 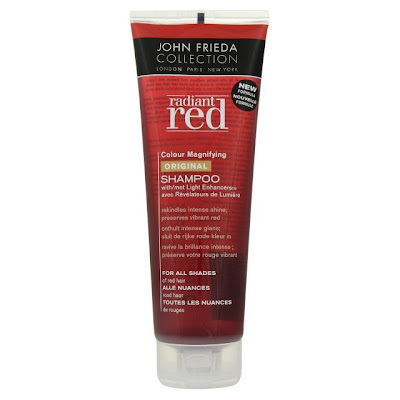 First up is John Frieda Collcetion Radiant Red Shampoo and Conditioner (not pictuered). After deciding i could no longer afford to keep my hair bleach blonde I decided to dye my hair a viberant red colour. I know that blonde hair has little pigmentation in it so that the colour cannot cling so well ans washes out quicker so I bought some dedicated hair treatments as it says it is anti-fade. I bought the shampoo and conditioner together as they were in a promotion in Superdrug and they were £5 each instead of the normal £7. This is really pretty pricey for me but I thought if they could help lock in the colour then they would be perfect. Now I know this isn't a scientific test but I don't think that these products helped lock in any more colour than if I used my own (much cheaper) normal products. The brand of hair dye I used to dye my hair (schwarzkopf XXL live hair dye) is the only brand I ever use and I know their products work REALLY well. The colour started to fade from hair about a week/ week and a half after dying it which I think is about the same as any other product. In fact I am pretty sure this shampoo uses Sulfate which actually strips out the colour (although I wouldn't say the colour faded any quiicker than normal). On the plus side you don't need to use loads of this product, it lathers up really well and will last for a long time. This product also has a strange smell. It's not bad but it isn't scented and smells slightly like chemicals. The actaul colour of the products is also a downside to me, they are actually bright red. Most hair dyes aren't the colour they make your hair so I feel like they just adeed in some red dye for no real benefit. Also I did find the shampoo stained my bath if it wasn't rinsed away straight away. FINAL VERDICT: My hair felt glossy after using these products but no more than any other shampoo I have used. As it didn't seem to help with fade out at all and it is very expensive I wouldn't buy this product again. 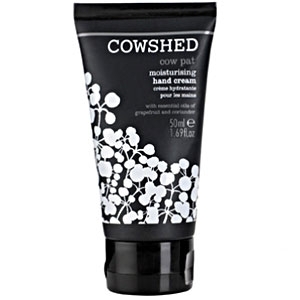 Cowshed's Cow Pat Hand Cream was a free sample with a copy of Instyle Magazine. Firstly I wanted to say how much I love the name, this is super cute. Secondly I found out that you can now buy this at boots. It is slightly costly, a 300ml pump will cost you £16 but this is really super stuff and after Christmas I will definatly be splashing out on some. You only need to use a itsy-bitsy amount of this at onCe so a bottle that big will last forever. When you first squeeze out some of the product it doesn't seem to smell but once you start to work it into your hands you get lovely scents of grapefruit and coriande. Unlike other handcreams this isn't overpowering but smells lovely and fresh. The cream itself isn't oily and is light enough to apply during the day. This left my hands feeling beautifully soft. This product doesn't contain any Parabens, Petrochemicals, Sulphates and Artificial Colours. And is suitable for Vegetarians! However on their site they do suggest that due to the high ratios of essential oils used a skin test is advisable. FINAL VERDICT: Expensive and not the easiest product to get hold of (it is out of stock on the Boots website!) but worth the money! Cidal Natuarl Antibacterial Soap from time to time i get a bout of hormonal acne but this product has dramatically helped reduce this. Actually it is really hard to get antibaterial soap. 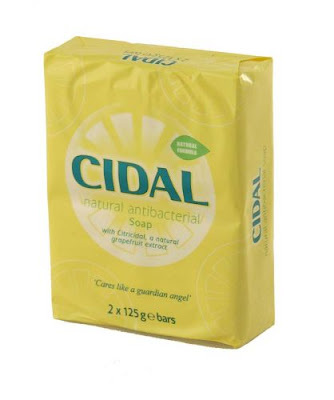 I look everywhere and could only find one brand- Cidal. After just a couple of uses of cidal soap, my skin cleared up considerably. This soap is super cheap (about 80p a bar) and can be found at Boots. It also has a lovely subtle grapefruit scent which is a bonus! FINAL VERDICT: Cidal soap is refreshing and revitalising and leave my skin blemish free. Next time it will be back to polish! Do they have the John Freida color wash where you are? It amps up your color and makes your hair super glossy. I have naturally red hair but use it in the summer to avoid going blonde!